The ISS physician team provides thorough electrodiagnostic testing and evaluation to better understand and analyze your chronic pain. 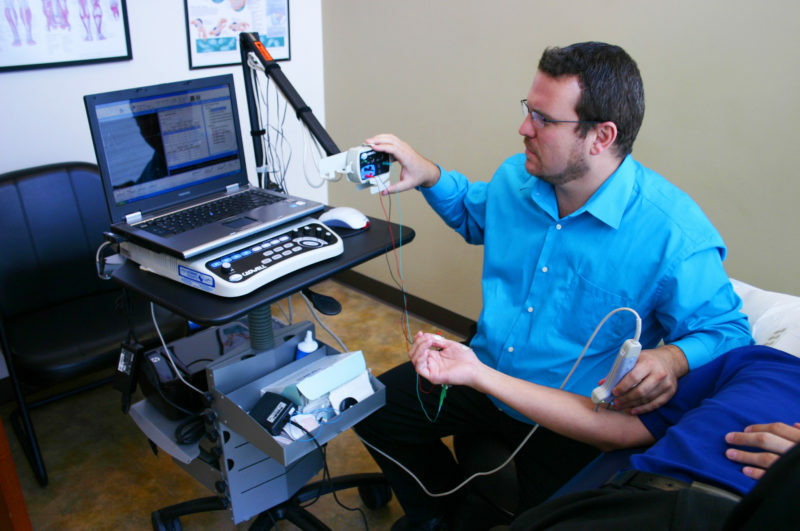 Electrodiagnostic testing can be helpful in evaluating weakness, numbness, and pain. The two main components of an electrodiagnostic test include the needle electromyographic examination (EMG) and nerve conduction studies (NCS). To perform nerve conduction studies, our physician will tape small surface electrodes onto the skin and apply a brief electric stimulus to one portion of the nerve. Nerve stimulation will cause a tingling sensation. Your physician can then evaluate the electrical response of the nerve or muscle to which the nerve is attached, and determine if the nerve impulse is conducted normally. Nerve damage and its severity are determined when nerve conduction is either slow or not at all present. During an EMG, your physician studies the electrical activity in your muscles by inserting a fine needle electrode into selected muscles. Needle insertion may cause mild, temporary discomfort. The needle is smaller than one used for an injection, and no shocks are given. The physician can determine whether the muscle is working normally by viewing the electrical activity displayed on a screen, while listening to audible signals transmitted over a speaker. The needles used are disposable and only used once. EMG/NCS results are forwarded immediately to your referring physician, who will then be able to coordinate further treatment. The time required for an EMG/NCS study is approximately one hour. There are no restrictions to activities before or after the test and there are no permanent after effects. Our team prioritizes your comfort above all else, which is why our expert EMG/NGS evaluators provide responsive, communicative, and thorough testing.